spatial@ucsb seeks to position spatial concepts as the driving force for spatial thinking and for the selection and use of spatial tools. Eight concepts are the focus of spatial reasoning in the use of geographical information. These concepts are demonstrable at all levels of space and time (from sub-atomic to galactic, past through future, and microseconds to ions). They can be rendered understandable through simple illustrations to young children but they are also sufficiently engaging at advanced levels for thinking about scientific and social problems. These concepts have been a foundation for researchers for centuries (see Classics in Spatial Thinking). They have been augmented in recent decades with computational and visualization tools and with vast and easily accessible information resources. These concepts and tools must be as central to general education as reading, writing, and arithmetic. In conjunction with the appropriate spatial tools, they provide a basic scaffold for designing research, solving problems, and structuring education programs. spatial@ucsb invites contributions about other concepts for spatial thinking (e.g., in design fields and in the humanities and arts). Examples may include the link between form and function in architecture, the search for pattern in speech and text, the use of spatial notation in music, the use of spatial metaphor in the sciences and humanities, the importance of place in cultural and social studies, and the spatial elements of aesthetics in the visual arts. If you wish to add concepts to the listing, please contact Don Janelle. See Teachspatial.org—a collaborative website devoted to promoting applications of spatial concepts and spatial tools in teaching and learning. Every type of spatial data has two components: a location and some attribute(s). In this way, location can be seen as a fundamental trait that both defines spatial data and separates it from other types of information. Broadly speaking, there are two types of locations: absolute and relative. Absolute location refers to an exact position on the Earth’s surface defined by some coordinate system. Street addresses and latitude/longitude coordinates are good examples of absolute locations. Relative locations, on the other hand, are defined in reference to other objects. For example, one could define UCSB’s relative location as 10 miles west of downtown Santa Barbara. The method of determining or measuring location is called georeferencing. There are many different ways of defining a georeference, but they all must meet a few requirements. First, the georeference must be unique so that only one location is described. Second, georeferences must have an accepted meaning that is shared so that most users understand its implication. Finally, georeferences must be viable throughout time so that their meaning is not lost. Metric georeferences are those which define location by measurement and are of particular importance in analyzing spatial data. In order to properly define a metric georeference, consideration must be given to the shape of the Earth, map projections and coordinate systems, and positional accuracy. Representing location is also an important concept in the use of spatial data. Spot locations are represented as zero-dimension points, lines as one-dimensional polylines, areas as two-dimensional polygons, and volumes as three-dimensional polyhedra. Hill, L. L. 2006. Georeferencing: The Geographic Associations of Information. Cambridge, MA: MIT Press. Distance describes the measurement or separation of two objects or places. At its most basic, measured distance provides a mechanism for describing spatial extent. In spatial reasoning, the classical case is that a positive relationship exists between distance and locational attribute similarity. The relationship, as worded by the Swiss-American cartographer, Waldo Tobler, is, “Everything is related to everything else, but near things are more related to each other.” Examining the strength, limitations, and exceptions of the distance-similarity correlation serves as the foundation of much quantitative and qualitative spatial research. Measured distance also provides a necessary dimension for describing position. All real points can be plotted with respect to another by coupling measures of distance with heading and/or time. Common application of distance include spatial analysis and modeling, physics and gravitation, distance decay, buffers, geodesics, route description and optimization, and qualitative comparison of place. Tobler, W. R. 1970. A computer model simulation of urban growth in the Detroit region. Economic Geography, 46(2): 234–240. Kimerling, A. J., P. Muehrcke, et al. 2005. Map use: Reading, analysis, and interpretation. Madison, WI. : JP Publications. A network is a physical or conceptual system of linkages among entities. Networks offer an infrastructure for representing the anisotropic relationships of various constituents and constituent attributes. Typically, a network connection denotes increased accessibility or relatedness along a link, and linkages may override the default notion that closer features are more accessible and related. For instance, driving from one side of a river to the other often requires a circuitous path many orders of magnitude greater than the direct distance from origin to destination. Networks commonly are represented by the elements: linkages, nodes, and intersections. Carefully crafted associations among these elements facilitate analyses regarding least-cost path optimization, measures of separation and similarity, and emergent spatial structures. Additionally, attributes can be assigned to various network elements to allow for directionality (e.g., a one-way street), intersection policy (e.g., a no U-turn rule), cost (e.g., a speed limit), and system regulation (e.g., synchronized traffic signals to control flow). Some applications of networks include traffic management, delivery systems, social structures, river hydrology, and communication systems. Ahuja, R. K., T. L. Magnanti, and J. B. Orlin 1993. Network Flows: Theory, Algorithms and Applications. Englewood Cliffs, NJ: Prentice Hall. Bialynicki-Birula, I. and I. Bialynicki-Birula 2004. Modeling reality: How computers mirror life. Oxford, New York: Oxford University Press; pp. 95–103. Neighborhoods and regions define areas surrounding and containing spatial data. They may be formal in nature, such as state and country boundaries, and informal, such as the colloquial use of terms like “downtown.” Regions may also be defined in terms of a particular function. For example, the functional region for a pizza restaurant may be the area within a city to which it delivers. Utilizing neighborhoods and regions can allow one to make inferences about data from its spatial context. Many fields use neighborhoods and regions in just this way. 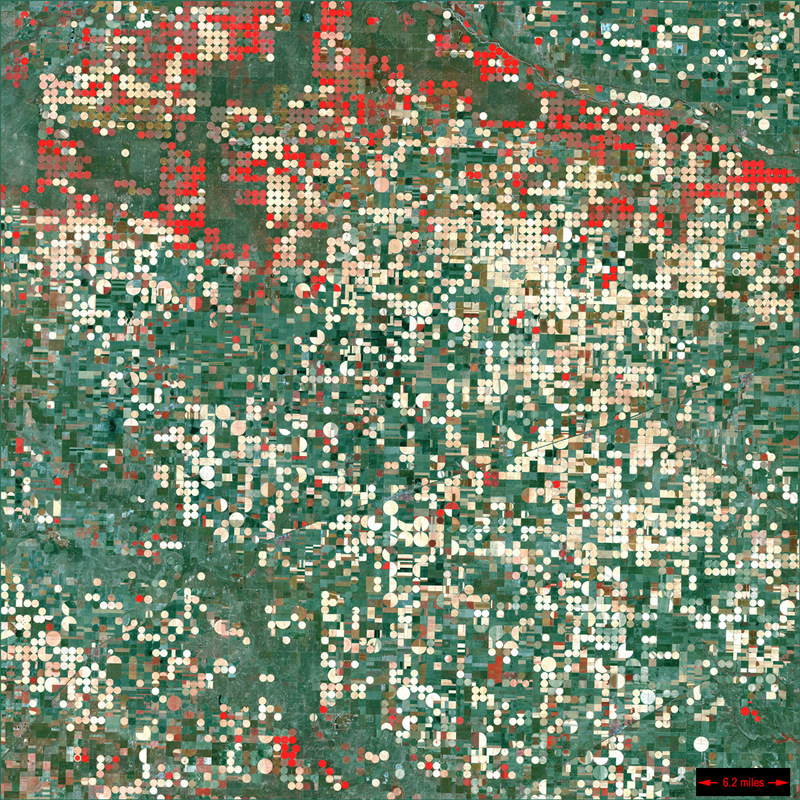 In remote sensing, neighborhood statistics can be calculated using the values of adjacent pixels. In business, service regions are defined to maximize the number and locations of stores or restaurant franchises. In landscape ecology, metrics have been developed to measure the fragmentation of environmental patches within an ecosystem. There are problems with making inferences between data at different scales, however. The modifiable area unit problem (MAUP), or ecological fallacy, involves two issues that underscore the use of data aggregated to the neighborhood or region. First, there is a problem of scale. In this way, results of analysis at one scale are not comparable to results at higher or lower levels of aggregation. For example, it does not make sense to use population density calculated at the state level to describe density at the county level. Second, there is a problem of aggregation. Changing region boundaries can have immense effects on the neighborhood statistics. The gerrymandering of voting districts is one example of an aggregation problem. Montello, D. R., M. F. Goodchild, J. Gottsegen, and P. Fohl 2003. Where’s downtown? : Behavioral methods for determining referents of vague spatial queries. Spatial Cognition and Computation 3: 185–204. Special Issue on “Spatial vagueness, uncertainty, granularity,” B. Bennett, & M. Cristani (Eds.). In spatial reasoning, scale describes the dimensional relationship between a representation and reality. Due to the large variation of all space, scale is used to project reality to more useful and meaningful sizes. For large expanses, scale is reduced (e.g., fitting the entirety of earth’s surface on to a paper map), and for miniscule distances, scale is increased (e.g., enlarging and schematizing chemical reactions). Often, scale is denoted as a fraction where a unit of measure in reality is compared to the same unit on the projection. For instance, a paper map of a landscape showing a scale of 1:10,000, would mean that a drawn unit on the map represents 10,000 of the same unit in reality. Offering spatial data at scales different from their original data collection granularity may imply changes of meaning; thus, data product limitations should be carefully considered by both creators and consumers of spatial information. As a fundamental spatial concept, applications of scale permeate many human activities including data collection, cartography, art, architecture, engineering, and nanotechnology. Goodchild, M. F. 1997. Scale in a digital geographic world. Geographical and Environmental Modeling 1: 5–23. Montello, D. R. 2001. Scale, in geography. In N. J. Smelser and P. B. Baltes (Eds. ), International Encyclopedia of the Social & Behavioral Sciences. Oxford: Pergamon Press; pp. 13,501–13,504. Sheppard, E. S. 2004. Scale and Geographic Inquiry: Nature, Society, and Method. Boston, MA: Wiley-Blackwell; 288 pp. Sinton, D. (1978). The inherent structure of information as a constraint to analysis: Mapped thematic data as a case study. Harvard Papers on Geographic Information Systems 7, G. Dutton (ed. ), Reading, MA: Addison Wesley. Spatial heterogeneity refers to the degree of variation in some attribute across places and region. For example, a satellite image of the Pacific Ocean would show little variation and thus would have a low level of spatial heterogeneity; whereas, an image of the patchwork of agricultural fields in the Midwestern U.S. may be considered highly spatially heterogeneous. In the same way that biodiversity defines species variation in biology, spatial heterogeneity defines variation of an attribute in spatial studies. There are many research implications caused by the fundamental heterogeneity of spatial data. In most cases, spatial data can be said to have a non-constant mean and variance throughout a study area. That is, local statistical parameters change with location and are thus not uniformly distributed. This characteristic of spatial data is termed non-stationarity and directly impacts research in areas such as sampling design. For example, it is very difficult to obtain a representative sample of a region because of the heterogeneous nature of many spaces. Another characteristic of spatial data that impacts research is the general rule that spatial data tend to become more heterogeneous as the study area gets larger. This means the variance observed in a small region is less than that in a larger region. That is, expected variation around the mean in small regions underestimates and, thus, is not applicable in subsequently larger regions. This uncontrolled variance in spatial data has impacts in the study design of projects involving large areas and times, such as global warming. Forman, R. T. 1995. Land Mosaics: The Ecology of Landscapes and Regions. Cambridge, UK: Cambridge University Press. Spatial dependence is the manifestation of Tobler’s first law of geography, which states, “Everything is related to everything else, but near things are more related to each other.” This seemingly simple principle applies to many types of spatial attributes. For example, one would expect the temperature of Santa Barbara to be more similar to the temperature in Los Angeles than to the temperature in Seattle. This relatedness between data based on the distance is also termed spatial autocorrelation. If spatial data were truly random, there would be zero spatial autocorrelation. Applying this idea to the previous example would mean that no inference of similarity could be made between the temperatures in Santa Barbara and Los Angeles. Fortunately, most attributes in the world are not distributed in this manner and thus display a certain degree of spatial dependence. Researchers can quantify spatial correlation by using indices such as Moran’s I and Geary’s C. Researchers can also model spatial dependence by using the methods developed in the field of geostatistics. Techniques such as kriging allow researchers to quantify the changes in attribute variance versus distance. This model of spatial dependence is called a semi-variogram, or just variogram. Variograms offer a mechanism to predict attribute values in locations where data are not present. These powerful interpolation tools have many real-world applications in fields such as mining and petroleum discovery, epidemiology, atmospheric science, oceanography, and soil science. Boots, B. N. and A. Getis 1988. Point Pattern Analysis. Newbury Park, CA: SAGE Publications Inc.
Isaaks, E. H. and R. M. Srivastava 1989. Applied Geostatistics. New York: Oxford University Press. Journel, A. G. and C. J. Huijbregts 1978. Mining Geostatistics. London: Academic Press. Objects and fields describe two fundamental, dichotomous, conceptualizations of space. Objects are collections of discrete, bounded entities, usually composed of geometric primitives, such as points, lines, curves, and polygons. Conceptually, object-based reality is considered empty space populated by distinct entities. Attributes are associated with bounded features to define and describe the objects. Conversely, field-based representation fills continuous space with attribute measures at all locations. A field offers a conceptual model of spatial variation, and attributes themselves, as opposed to workings of distinct boundaries, define the field. The object-field dichotomy serves as the underpinning for all methods of spatial representation and analysis, and each perspective offers a characteristic set of abilities and limitations. For instance, objects offer logical concepts like “inside” and “outside,” and comparisons such as intersections and buffers. Fields are particularly suited for spatial phenomena considered less bounded, like air, water, temperature, and elevation. Not constrained by distinct edges, fields lend themselves to analyses related to interpolation and global attribute comparison. Analysis and representation of fields often yield areas of peaks, valleys, aspects, and slopes. The representational and analytical potential of both perspectives is mirrored in computer software for modeling reality. Modeling software for analyzing property boundaries, road networks, and individuals, tend to use object-based representation methods. Software for analyzing less-bounded phenomena, like temperature variation, ocean circulation, and hydrologic modeling, typically use field-based models for database storage and analysis. Ongoing research on the object-field dichotomy has focused on repercussions of accuracy, uncertainty, and usage, the philosophy of spatial reality within the context of such representations, and defining and utilizing object-fields hybrids. Common domains using objects and fields are Geographic Information Systems, spatial ontology, spatial analysis, and database design. Couclelis, H. 1992. People manipulate objects (but cultivate fields): Beyond the raster vector debate in GIS. Theories and methods of spatio-temporal reasoning in geographic space. Frank, A. U. and I. Campari. Berlin: Springer-Verlag; 639: 65–77. Goodchild, M. F., M. Yuan, et al. 2007. Towards a general theory of geographic representation in GIS. International Journal of Geographical Information Science 21(3): 239–260. Peuquet, D. J. 2002. Representations of space and time. New York: Guilford Press.